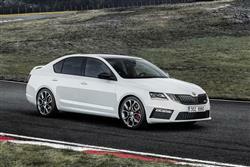 You know the Skoda Octavia vRS. It's the car you dread to see in your rear view if you're making progress a bit enthusiastically on the motorway. The police buy them because they're subtle, fast, reliable and affordable; four attributes that work well with private buyers too. This improved model gets smart LED headlights, an interior upgrade and the option of either a 245PS petrol power output or a 184PS diesel unit. In other words, don't be tempted to try to outsprint one. 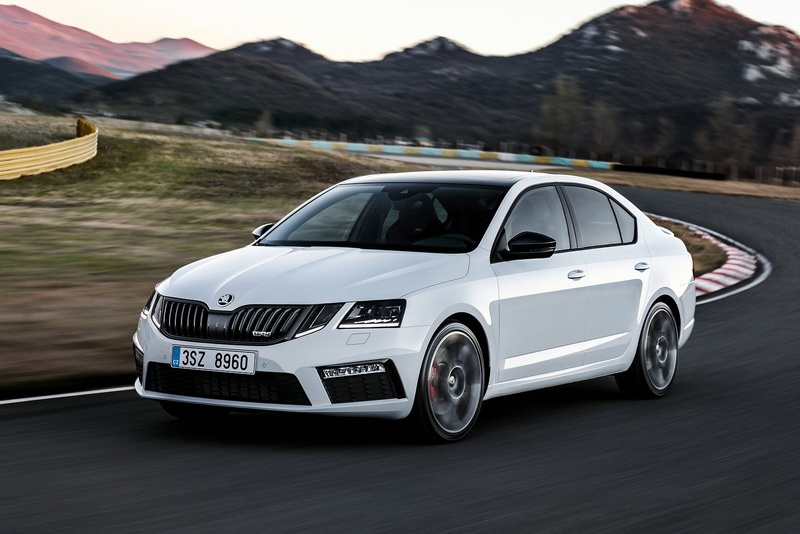 Yes, the vRS is the go-faster model of the Skoda Octavia range, available at a time when going faster seems to be about as socially acceptable as a Gary Glitter comeback tour, but stick with it. There's a lot more to this car than flicking the vees at the mandated speed limit. The vRS has long been a car that's all about making discreet progress, which is why they're the darlings of motorway police the length and breadth of the country. They're capable but subtle. Granted, a GATSO camera's not going to differentiate between a navy blue Octavia and a lime green Lambo, but if you prefer not to draw attention to the fact that you enjoy your driving, the vRS is a wholly informed choice. The car we're looking at here is an improved version of the third generation vRS model, although those of you with longer memories might well recall the first generation car initially being badged an RS. That car first appeared in 2001, with the bigger and better built second generation model arriving in 2005. This signalled a change from a 1.8-litre turbo four to a 2.0-litre engine, adding 18PS in the process and lifting peak power to 200PS. The MK3 vRS was initially offered with a 220PS 2.0 TSI petrol engine optionally upgradeable to 230PS. In this revised form, the 2.0 TSI engine has been standardised in 245PS form and, as before, you can specify a 184PS 2.0 TDI desel engine with or without 4WD. Plus there's an estate bodystyle if you want it. Of course, you want to know how quick the VRS is. I did. So, being completely useless at suspense, here's the detail. 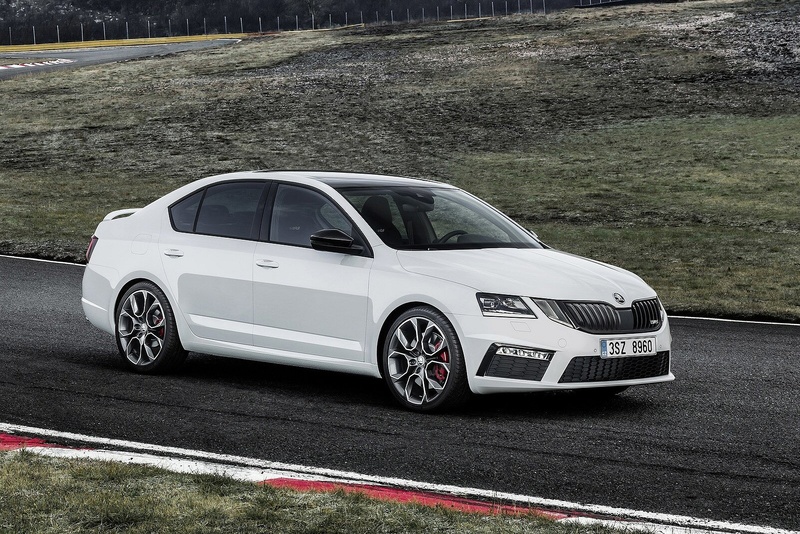 The 2.0-litre TSI petrol driving through a six-speed manual gearbox will punt the 245PS petrol Octavia vRS to 62mph in only 6.6 seconds. The maximum speed is around 155mph. Plump instead for the diesel engine and you're looking at 7.9 seconds to 62mph and a top speed of 144mph. There's a six-speed manual gearbox as standard but all models can be specified with a DSG dual clutch transmission if you have a lazy left leg. The diesel gets a 4x4 option too. The sports chassis lowers the body by 15mm, plus the rear track is 30mm wider than before. Wheel dimensions range from 18 to 19 inches and there's an ESC stability system with XDS+ electronic inter-wheel lock, for extra cornering traction. Buyers also get a 'Performance Mode Select' system which allows throttle feel and steering to be tailored to driving preferences. Plus there's an optional 'Performance Sound Generator' if you want a rortier engine note. Available in either hatch or estate guise, this revised Octavia vRS features an expressive four-eyed face. The headlights, fog lights and tail lights all now feature LED technology and details like the black radiator grille, the distinctive air ducts, the spoiler and the large exhaust pipes hint at the dynamic character. Other highlights include the red-lacquered brake calipers and a choice of 17, 18 or 19-inch alloy wheels. You'll get the best ride quality on the standard 17-inch alloys, with their 45-series tyre profile. Step up to the 18-inch rims and that tyre profile drops to 40 series, so you'll find B-roads a bit bumpier. The rear end is dominated in the lower section by a strong black diffuser, overlying wide reflector spotlight and the two large, trapezoidal-shaped chrome exhaust tailpipes. There's also a spoiler, which, on the estate vRS, is fitted as a roof-edge item. Inside, there are vRS sports seats with leather/fabric covers (with Alcantara trim offered as an option), plus the cabin gets elegant decorative strips and ambient lighting. It also helps that this is one of the most spacious interiors in the class - there's a lot more space that you'd get in comparable Focus ST, Golf GTI or Leon FR models for example. There's also stacks of clever storage ideas. They include a multimedia holder with space for an iPod, a mobile phone and the like. You can also specify foldable cargo elements for a boot area which can feature a double-sided floor covering. 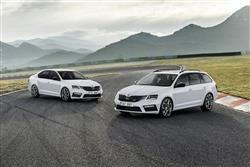 On that subject, the boot volume in the Octavia vRS hatch is 590-litres, while in the estate vRS, it's 610-litres. Prices range from around £28,000 to just over £32,000 and there's a choice of two bodystyles, hatch or an estate, the station wagon requiring a premium of around £1,200. Pricing is very similar whether you go for the 245PS petrol model or the 184PS 2.0 TDI diesel. Petrol buyers get the option of an uprated 'Challenge' spec. Equipment features on top models include an electronic limited slip differential, heated electrically adjustable leather seats and park assist. DSG automatic transmission is an option across the range - and you have to have it if you go for the diesel and decide to pay the £1,500 premium for 4x4 traction. 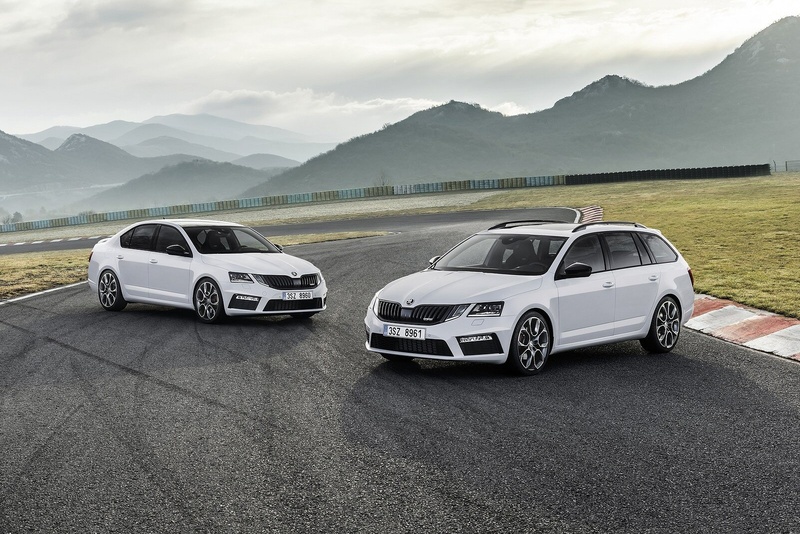 Across the vRS line-up, the interior features integrated ambient lighting for the internal door handles, well-designed sports seats for the driver and passenger and a sporty three-spoke steering wheel with perforated leather. The gear stick and handbrake are trimmed in leather while the sill plates and pedals are stainless steel. The instrument panel gets a full colour Maxi DOT display in its own vRS design. 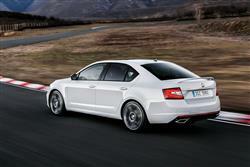 The steering wheel, gear stick, door sill panels, seats and floor mats all sport the vRS logo. The Octavia vRS features an integrated safety system with Front Assistant and city emergency braking, Lane Assistant to keep you on track, Automatic Post Collision Braking System with automatic brake intervention in the event of an accident, Crew Protect Assistant to protect the vehicle under accident conditions and the Driver Fatigue Sensor. In the event of an accident, a comprehensive package of passive safety features work to provide the best possible protection for the driver and passengers with up to nine airbags. As well as offering a good deal more pace and space, the latest Octavia vRS doesn't do at all badly on economy and emissions. Of course, the diesel version does best, managing 49.6mpg on the combined cycle and 118g/km of CO2 in manual hatch form. Go for the 4x4 diesel version and the respective figures fall to 43.5mpg and 139g/km. For the petrol TSI version, the returns deliver 38.2mpg and 156g/km in a manual hatch model or 37.2mpg and 144g/km with a DSG auto fitted. Start-Stop and Brake Energy Regeneration are of course fitted as standard. 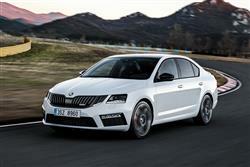 If you�re looking for a new SKODA Octavia 2.0 TDI CR vRS 5dr Diesel Hatchback for sale, you�ve come to the right place. At Bristol Street Motors we don�t just have the best SKODA Octavia 2.0 TDI CR vRS 5dr Diesel Hatchback deals, we also offer friendly advice and help with all your enquiries to ensure your buying experience is a happy experience.